The advantage of feeding sugar syrup to your bees is that it will not granulate so the bees can always utilize sugar syrup so long as they can reach the store in the hive. Honey left on the hives in the autumn can occasionally be rock solid and useless to the bees in the winter. 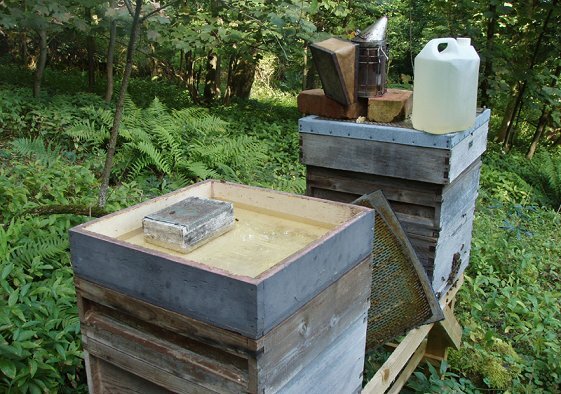 Syrup is fed when it is warm enough for the bees to move it around in the hive and evaporate the excess water. Solid candy is used during the cold winter months. All the beekeeping textbooks give details of the proportions of white sugar to water, the easiest method is to fill a container with white sugar and then add hot water up to the original level of the sugar. Carriers like the one in the picture above can be shaken and are reasonably leak proof when being transported. It is worth warming the sugar first and then adding water from the boiled kettle; using cold sugar and cold water or simply warm water means that making sugar syrup and dissolving the sugar is a tedious and slow process. Mid September is the ideal time to feed in the autumn, the brood nest has usually shrunk in size and there is a reasonable chance that the syrup will then be stored in the empty cells near the remaining brood nest. Whilst the weather is still mild the bees are able to climb up the inlet to the feeder. Emergency feeding of syrup in cold early spring may need to be via a contact feeder. Miserable cold summers may necessitate feeding even in June and July, particularly if any honey crop has been taken off leaving the bees low on stores. It is best to feed bees in the evening to reduce the risk of other bees robbing the hive. Always wear a veil, even when just topping up feeders in the evening; despite the top of the hive being sealed by the feeder very angry bees can investigate you from the door of the hive in the cool of the evening.